Four different fluorinated surfactant-based systems were used as template for the synthesis of highly ordered TiO2 mesoporous materials with large-pore wormhole structures. 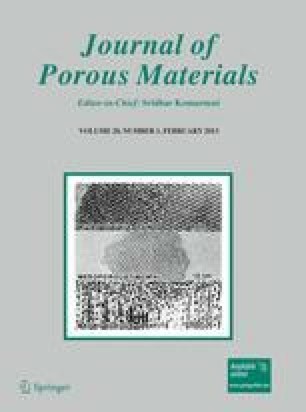 The calcined materials exhibit large pore diameters (up to 5.9 nm), high surface areas (900–1,180 m2 g−1), pore volumes (0.90–1.25 cm3 g−1) and thick pore walls (4.6–7.7 nm) depending of the synthesis route. It is established that the self-aggregation behavior of fluorinated amphiphile systems can be manipulate and provides a rich phase behavior to obtain well-organized titania sieves with adjustable pore size and surface topography. By comparison to titania and silica sieves obtained by the same procedure, it can be established that there is a deep interaction between head groups of fluorinated surfactants and Ti(IV)(iPrO)4 showing that the inorganic precursor has a great influence on the properties of the final materials. The authors acknowledge Universidad Nacional del Sur (PGI 24/ZQ07); Concejo Nacional de Investigaciones Científicas y Técnicas de la República Argentina (CONICET, PIP-11220100100072); Education Audiovisual Culture Executive Agency, European Commission, EMUNDUS18 and Xunta de Galicia for their financial support (Project No. PXI20615PN). PM is an adjunct researcher of (CONICET).